Mayday! . . . Mayday! . . . I am go’n down! I thought about this for a minute. It might not be a bad idea. After all, we are all “one bad landing” away from catastrophe. So, perhaps, we should all take up golf . . . just in case. If nothing else, it would give us something to do on non-flyable days. Sunday, 11 Nov 07. 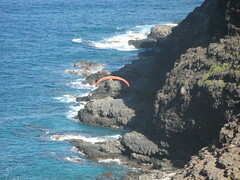 I launched Cactus and flew the entire Makapu’u ridge. It was a beautiful, strong E-NE day. I flew over towards the lighthouse and, since I had a lot of altitude, I flew around the point and soared the eastern ridge. I’d never soared that ridge before, though I’d tried several times, so it was quite a memorable flight. I pulled up my wing and found myself dragged onto my rear-end, staring up at my wing. I kited it to a flyable configuration and prepare to stand up and run off of the cliff. Reaper, however, suggested that I lock my right carabiner, -- which was unlocked -- so as to prevent my riser from jumping out of my harness – “incident” occurred. Thus, I ran off of the cliff and flew for about an hour. I was at 1400 ft with the windsock pointing E/NE. So, I headed towards the lighthouse. I got there, very high. So, I went around the point; so that I could soar the eastern ridge. I got a few beeps from my FlyTec . . . enough to convince me that it was a GREAT IDEA! Then, as I flew down the ridge, I noticed that I was NOT gaining altitude. In fact, I was losing altitude. I got back to the point – eye-level with the tourists at the Lighthouse Lookout. I got around the point with a LOT less altitude. I knew I was NOT going to make the beach. There are SEVERAL peninsular out-croppings along the ridge; each of which has the phrase “USA 39 cents” in the corner. (That is a “postage stamp” reference – I only say that because some of the pilots on the LZ didn’t understand the joke.) I picked out one of these rocky, ugly, “this is NOT a good idea,” sections of lava. I started my final approach. I slowed the wing to stall speed – HANDS UP! ; Stall speed – HANDS UP! ; Stall Speed – HANDS UP! I thumped my rear-end against a boulder at a very high speed (Damn! That is uncomfortable!) and plunged my feet into the gravel. I kited my wing down and signaled to the lifeguards that I was “fine.” Then, I balled up my wing and stuffed it into my backpack. So . . . I set my gear down and started to scout out a path out of this hell-hole. As I climbed, I encountered not one, but THREE more golf balls . . . just sitting there, minding their own businesses. (No . . . I have NO IDEA where they came from!) Luckily . . . “Bob-of-the-Year,” who was flying above me, was willing to top-land at Cactus; stow his gear; grab a rope & fins; and come rescue me. Doug, who had just arrived, was, also, ready to hike down and rescue me. As it turned-out . . . Doug arrived first. As I climbed the cliff, I came into contact with . . . not ONE, but TWO more golf balls!! (No . . . I have NO IDEA where they came from.) We made it back to Lazy Man without incident. Reaper helped me get untangled and airborne . . . I had a GREAT 2nd flight & and perfect landing. This is the point where I would NORMALLY end with an intellectually deep & emotionally profound “Moral to the Story.” Unfortunately, I don’t have one. So . . . I suppose, this is the message: We are all “one bad landing” away from catastrophe. So, perhaps, we should all take up golf . . . just in case. If nothing else, it would give us something to do on non-flyable days. Much Mahalo to Doug & Bob for all of your help. 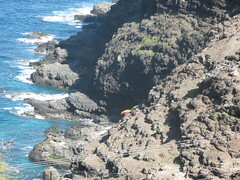 The ONLY picture of me in the "ever revolving" WIndlines.net Banner is Me, in my Vulcan, very low, along the Makapu'u peninular outcroppings!! Alex . . . nice bit of foreshaowing!! !